On the heels of one of the most devastating knockouts in boxing history, Yahoo! Sports analyst Kevin Iole gives his top 15 KOs of all-time. 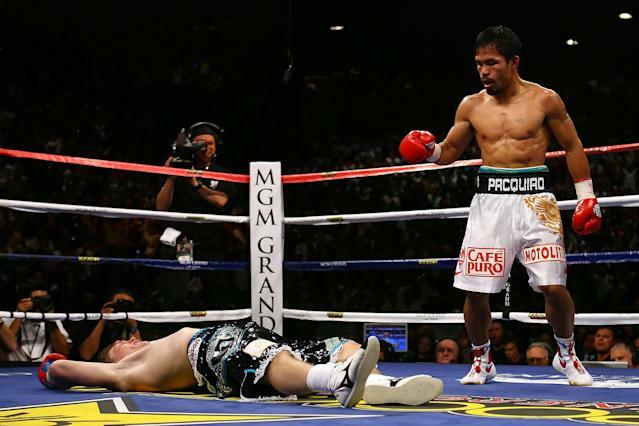 Where does Juan Manuel Marquez's knockout of Manny Pacquiao rank in history? 12. 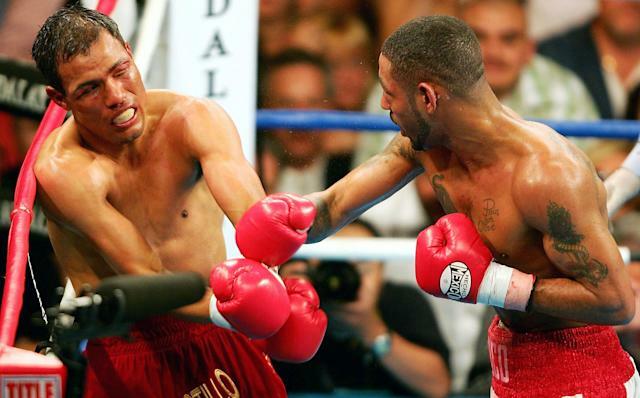 Diego Corrales TKO10 Jose Luis Castillo, May 7, 2005 – The first nine rounds were incredible, but the 10th is one of the all-time greats. Castillo knocked Corrales down twice early in the round and Corrales seemed like he may not be able to continue. Out of nowhere, he crushed Castillo with a straight right that essentially put Castillo out on his feet. He landed several more shots before referee Tony Weeks jumped in to halt it and give him the improbable win. Mike Tyson is restrained after knocking down Michael Spinks in their fight. 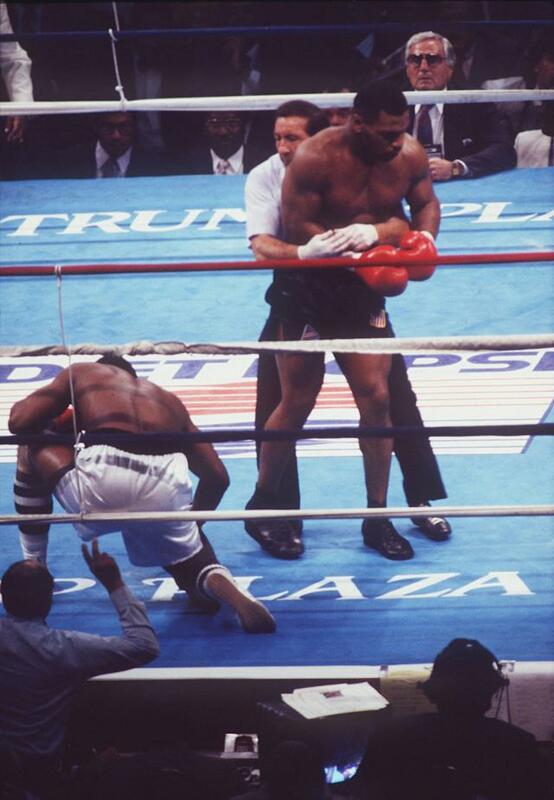 Mike Tyson KO1 Michael Spinks, June 27, 1988 – This fight was Tyson at his peak, as he terrorized a petrified Spinks. It was a matchup of two unbeaten men holding heavyweight belts, but Spinks was battered around until Tyson stopped him. Tyson decked Spinks with a right to the body about 70 seconds into the fight. Spinks got up, but Tyson went right after him and quickly knocked him out with a short right hand. 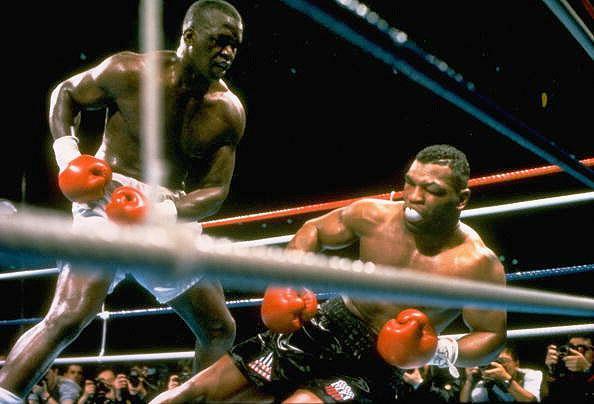 Buster Douglas knocks out Mike Tyson. Buster Douglas KO10 Mike Tyson, Feb. 10, 1990 – Tyson was a 42-1 favorite to defend his IBF/WBA/WBC heavyweight titles, but he was in trouble right from the start. He had a powerful jab that he kept popping in Tyson's face. Tyson dropped Douglas in the eighth, nearly saving his title, but Douglas came back strong. He hit Tyson with an uppercut and then a series of shots, that dropped Tyson. Tyson was unable to get up and suffered his first, and most stunning, defeat. Thomas Hearns KO2 Roberto Duran, June 15, 1984 – Hearns showed his power in this fight, dropping Duran twice in the first and ending the fight with a blistering straight right in the second that sent Duran face first to the canvas. 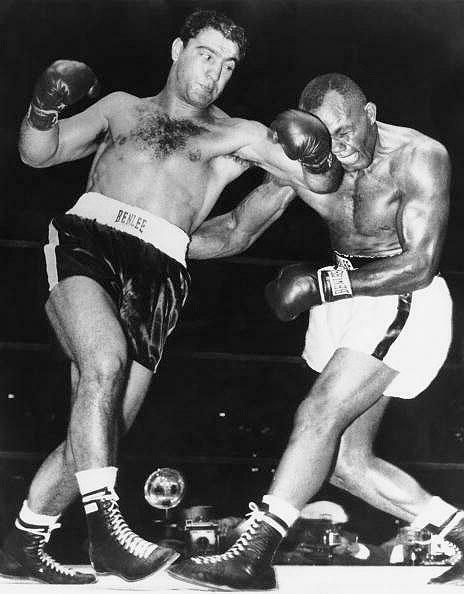 Rocky Marciano TKO13 Jersey Joe Walcott, Sept. 23, 1952 – This fight marked the start of Marciano's reign as heavyweight champion. He was far behind on points, but caught Walcott on the chin with a right cross that led to one of the great boxing photos of all-time. The photo showed the punch at the moment of impact, with Walcott's face grotesquely contorted. Marvelous Marvin Hagler KO3 Thomas Hearns, April 15, 1985 – Regarded by many as the best short fight in boxing history, Hagler was too powerful for Hearns and proved it in this all-out slugfest. 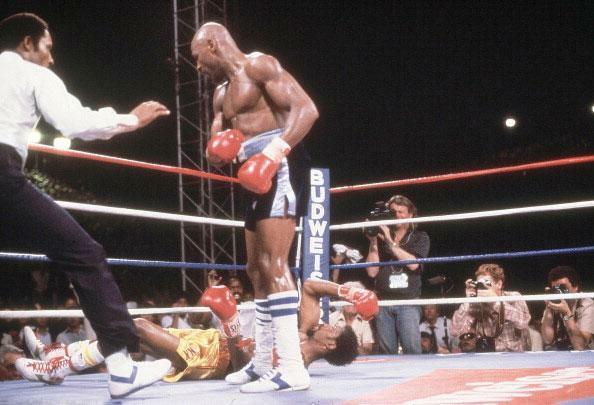 Hagler was cut in the third and knew he'd have to do something dramatic. Hagler landed a right hook to the head that staggered Hearns. Hagler literally ran across the ring after Hearns and cracked Hearns with a right. 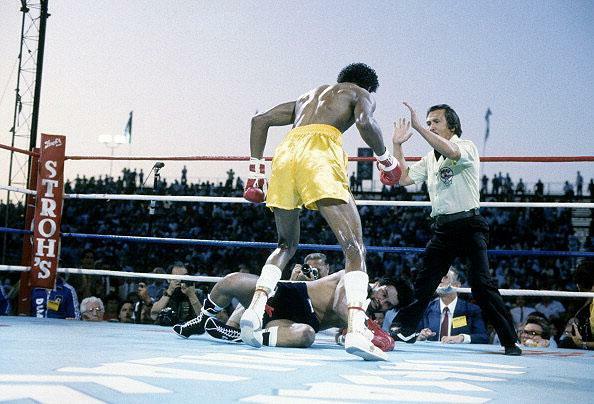 Hearns fell face first as Hagler celebrated a hard-fought win. Joe Louis TKO1 Max Schmeling, June 22, 1938 – With tensions rising between the U.S. and Germany because of the Hitler regime's aggressive foreign policy, the fight had societal, as well as sporting implications. 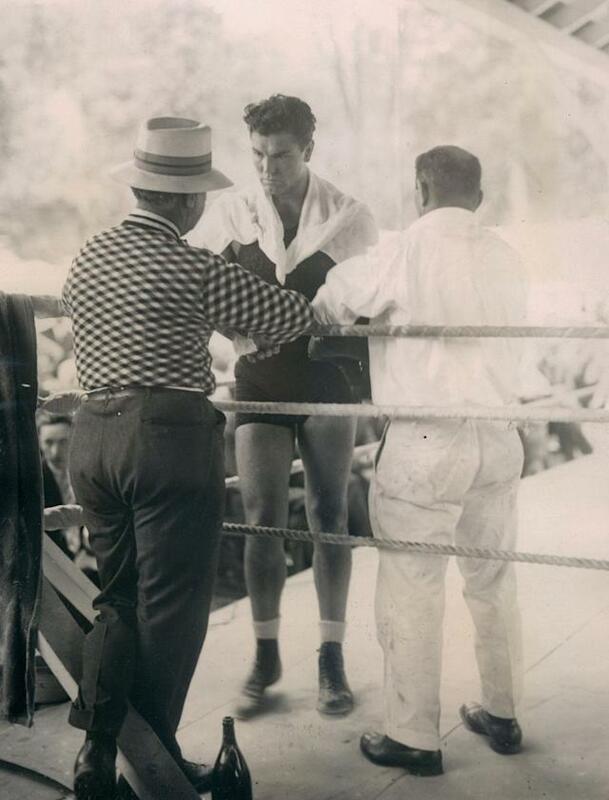 Schmeling had beaten Louis in 1936 and Americans badly wanted to see Louis get revenge. 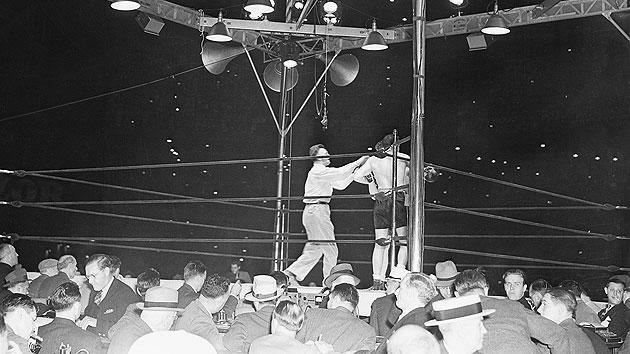 He did so in a big way, knocking Schmeling down three times in the first, forcing referee Arthur Donovan to stop it. 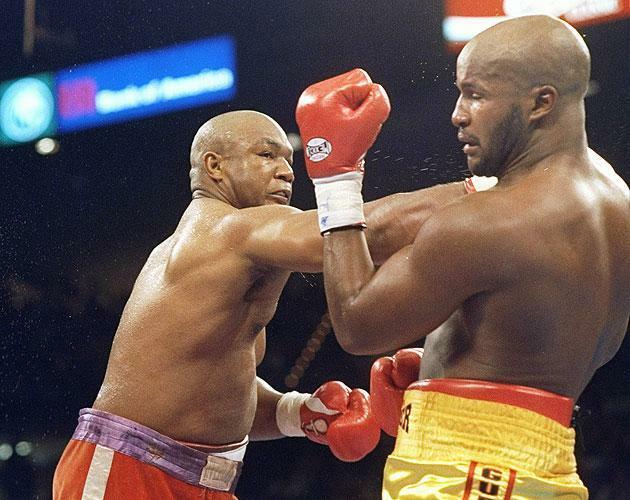 George Foreman KO10 Michael Moorer, Nov. 5, 1994 – Foreman was 45 years old and trying to regain the heavyweight title. He was being badly outboxed by Moorer throughout the first nine rounds, when his legendary punching power came to the rescue. Foreman threw a jab and a straight right behind it, crumpling Moorer, as HBO broadcaster Jim Lampley shouted, "It happened! It happened!" Foreman became, at 45, the sport's oldest heavyweight champion. George Foreman TKO2 Joe Frazier, Jan. 22, 1973 – Frazier entered the bout as the champion, with a record of 29-0 with 25 knockouts. 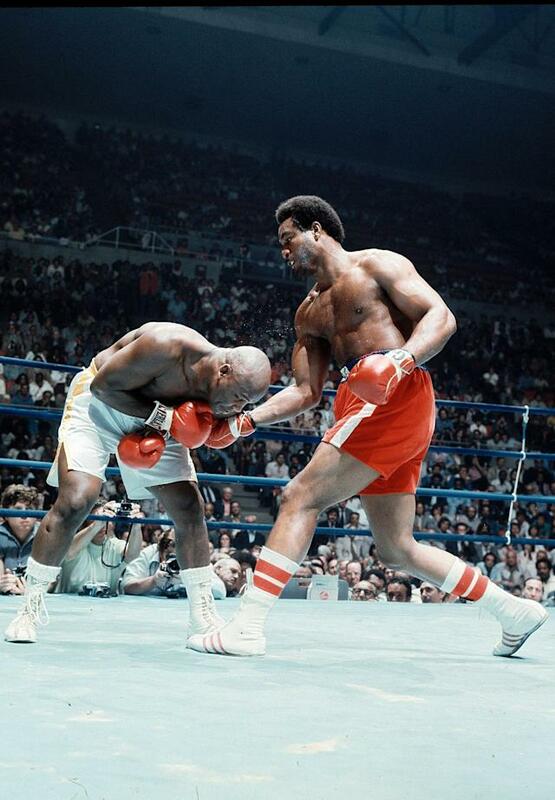 Foreman was 37-0 with 34 knockouts. It promised to be an action-packed fight, but it was all one-sided. 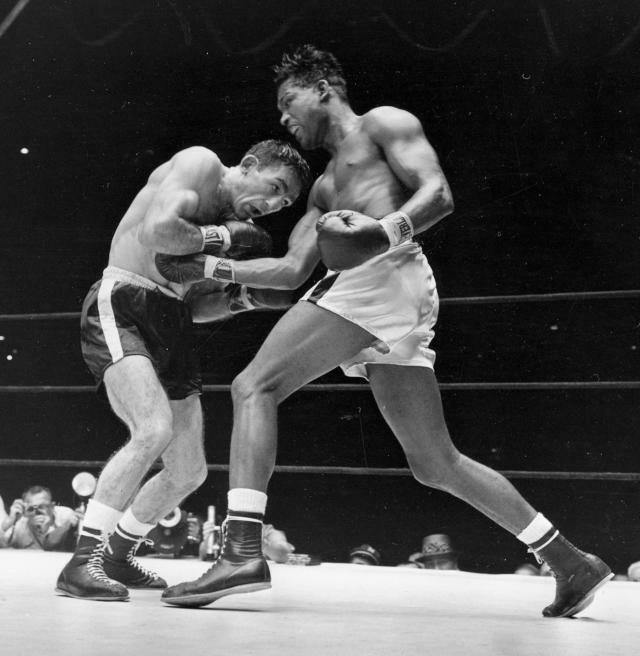 Foreman knocked Frazier down six times, once lifting Frazier off his feet with a punch, en route to claiming the title.